It's been another busy week at GeekTonic. We've been putting the Kindle2 through the paces, and trying out lots of new HTPC stuff. In case you missed anything from the past week, here is a summary of the past week's news and stories on GeekTonic. Check out the GeekTonic Media Gadget Showcase - Be sure and sign up for the Gadget Showcase at GeekTonic. 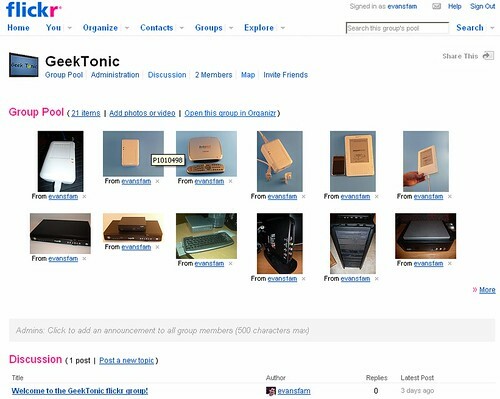 Get started by joining the GeekTonic Flickr Group and adding photos of your media gadgets and Media Setup photos for a chance to win Amazon Gift Certificates and more. Netflix New Watch Now Picks for the Week - Man they're releasing a lot of streaming movies on Netflix these days. Much of it is bargain-bin $1 movies at best, but there are some jewels in there as well. 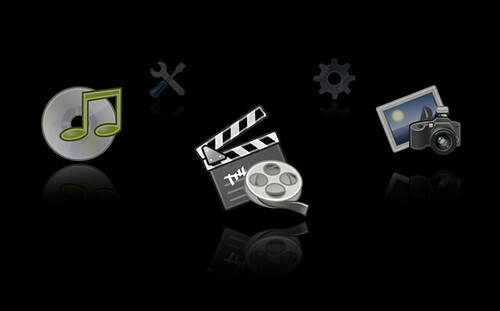 Elisa Media Center Now Available for Windows - Elisa, an open-source, Linux-based HTPC software arrives for Windows. 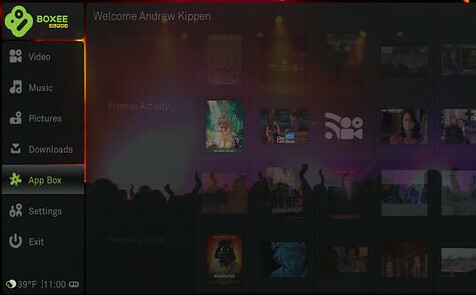 Boxee Update: New Version & Hulu Lives On via RSS - The Boxee and Hulu cat-and-mouse games begin. 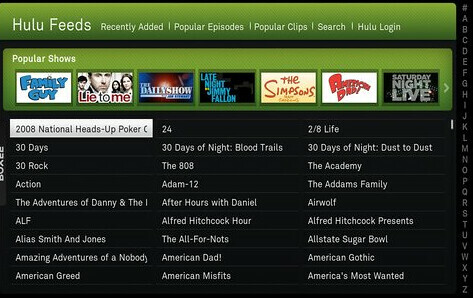 Boxee begins supporting Hulu via RSS feeds and within 12 hours Hulu cuts them off again. Then a few hours later Boxee fights back by adding it back. Fun stuff here my friends. Barnes and Noble Picks up Fictionwise - If you doubted that eBooks are going to be prevalent in the very near future think again. Vidabox Premium Wireless HTPC Keyboard 10% Exclusive Discount - We have a winner for the Vidabox Premium Wireless HTPC Keyboard. If you didn't win, be sure and get the 10% discount exclusive to GeekTonic readers. Kindle for iPhone Has Arrived! - good stuff for iPhone/Kindle2 owners. New Mac Mini with NVidia Graphics & More Power - HTPC Ready? - Definitely a decent device for HTPCs. Deal of the Day: Hauppauge HD-PVR $165 - If you want a Hauppauge HD-PVR to access all Cable/Satellite content including digital channels, check out this deal - best price so far! Amazon Allows Neutering of Kindle 2 Text to Speech - One of my least favorite news items from last week, but hopefully there won't be many books with text-to-speech disabled. TV Premieres: What to Watch 3/01 - 3/07 - a favorite of GeekTonic readers. All the new and returning shows for the week. A series on GeekTonic featured each Sunday morning. Phew! So that's a wrap for this week. Kindle 2 Reviews - Shelly (my wife) has had her review finished for days so after a long week at work, I'm finally putting the finishing touches on my review. Both will be published by Monday. There are many Kindle 2 reviews out by now, but none will come from our unique perspectives. I'm the gadget fanatic fascinated by the new technology and my wife is the avid reader who as a teacher has a very interesting perspective on the Kindle technology. Don't miss these reviews. Kindle 2 tips and tricks - if you have a Kindle, you're going to want to check these out. I've been compiling all of the little hidden tricks, hacks and keyboard shortcuts that I'll be sharing over the next couple of weeks. Windows Media Center versus SageTV Media Center Roundtable Podcast. I'm teaming up with a couple of guys for a podcast episode that will focus on VisaMC (and Windows 7 MC) compared to SageTV. This one is going to be fun for all and a must-listen for HTPC enthusiasts. 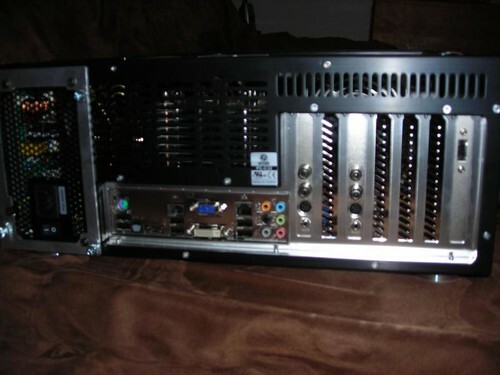 Our first submission for the GeekTonic Media Gadget Showcase Series is an HTPC build by Sodarkangel. He was on twitter talking about his setup so I asked if he'd be willing to share it on Geektonic. NOTE: This is a guest post by sodarkangel. This is the first in the GeekTonic Media Gadget Showcase Series. To read more about how to submit your photos and/or writeups for this series, read this. 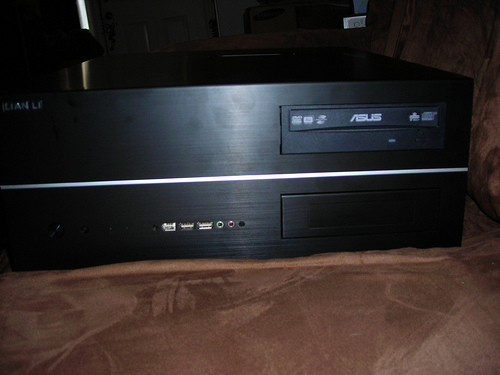 I decided a while ago I needed to build a new Home Theater PC (HTPC). The problem was, Windows 7 was so far away but I couldn't even play HD files on the old one. I bought a new TV a few weeks ago, a Samsung LN52A850, which I'm extremely happy with. The new TV spurred the need for something new, so I said screw it, and pieced out my new HTPC and built it. I chose this case because it was pretty and had a very good design for being a very very quiet pc. 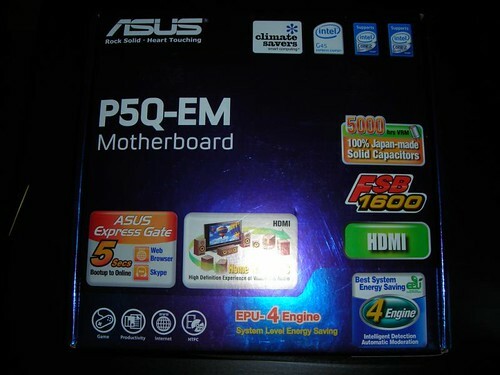 This processor was in my main pc, I upgraded it to a Core 2 Quad. Great heat spreading, and I didn't need to put a fan on it. 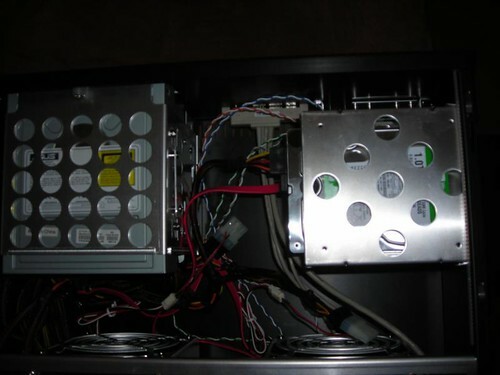 Ample power, nice design (unfortunately not modular), but very power conservative. I choose G.Skill because I've had nothing but great experiences with them, and I work with a lot of PCs at work. Nice and big, and an attempt at low power consumption. I chose this card because it takes 1 cable line, and splits it into 2, and each has 2 hybrid tuners, so I have 4 total tuners capable of both HD or Analog. I had a DVD-RW drive already for it from my main PC, and put a blu-ray in that, because we already have a Blu-Ray player. 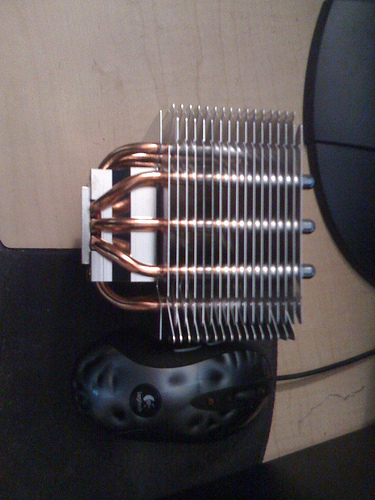 The build was simple, I had to monitor heat to make sure it wasn't getting too hot without having a CPU fan, but it was fine, and VERY quiet. I was very happy with the main build. The OS install was just as easy, installed Windows 7, very smooth install. Now the fun began, I added an external Rosewill wireless N USB adapter, and that install went fine, but when it came to the RocketFish bluetooth adapter, that was not so much fun. It took me quite a while to find out that it wasn't going to be possible to use the normal drivers for it (even via download from the site), but after some time spent I got the built in bluetooth drivers for Windows 7 to work. The remote that came with one of the Hauppauge 2250s installed without a hitch or any software, it just worked. Setting up the Windows Media Center was a challenge, only because the guide site must have been down, because I spent a long time working on the set up, and could not get guide data for the life of me. I came back to it the next morning and went through the setup again and it got the data just fine, but I did spend a couple hours trying to figure it out. I have it outputting at 1080p resolution to the TV, but I had to increase the size of the things on the screen to the large setting, due to us sitting across a big room from the TV. I have not yet gotten around to trying to set up my Logitech Harmony 880 for it yet, because I'm not sure if it'll be a challenge or not, so right now I have 2 remotes, but I'll get around to it as soon as I get a chance, but the system performance is great, and everything seems to be working very well. I'm an old time Beyond TV user, I'm just trying out Windows Media Center, there are things I like, and things I don't, so I'm not sure if I'll stick with it or not, but for now it does what I need. 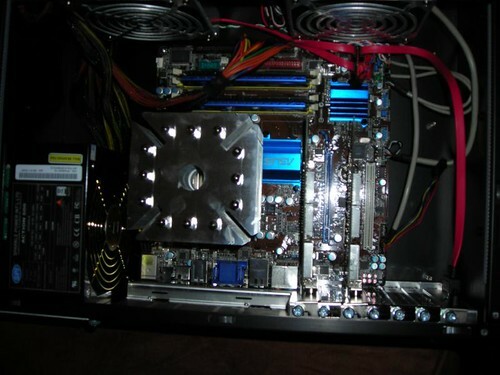 But this build is VERY VERY quiet and that makes me very happy, my wife loves it as well. So that's my new HTPC in a nutshell, with a few pictures to boot. I hope you enjoyed the read. Feel free to ask questions in the comments below. Thanks to sodarkangel for sharing! If you'd like to have your setup or media gadgets highlighted, read the guidelines for submission here. They giveth, they taketh away. Not happy with just ticking off all Boxee users, Hulu has moved on to blocking the next software media player, MyMediaPlayer using Hulu to stream online video content. MyMediaPlayer is an Adobe Air app that gives it's users the ability to view Hulu.com's library of TV shows and movies in fullscreen TV mode. MyMediaPlayer is open source and leaves all Hulu content and ads intact. It was really a simple alternative interface to view Hulu content. Unfortunately Hulu seems to be on the warpath to scratch out any third party apps that use Hulu content to allow the viewing of that content from anything other than the stadard Hulu Browser. The developer of MyMediaPlayer wrote an open letter to Hulu outlining the reasons Hulu should reconsider the rejection of his player. Boxee who recently was asked to block the Hulu content on their HTPC app are also appealing to Hulu, but I seriously doubt we'll see any progress on this front as Hulu seems to have been "forced into a box" by it's owners, CBS and Fox who are protecting their cable network business model (supposedly provides over 49% of their revenues). So for now, I would put little hope in seeing Hulu survive in any third party app going forward. That will affect many Media Center users, SageTV users, XBMC users, DivX Connected users and even PlayOn. It looks like its just a matter of time before the backward-looking media execs kill off any progress made on the Hulu App front. Sad, but true. After reports began to surface yesterday that Blockbuster was hiring an outside firm to discuss the possibility of a bankruptcy filing, their stock plummeted over 75% before the market close. Later that day, reports (CNN Money) came out that Blockbuster hired Kirkland & Ellis for "assistance with our ongoing finance and capital raising initiative" according to the Blockbuster spokesperson Karen Raskopf. Having experienced a company going through bankruptcy I see this as the standard "we are not filing for bankruptcy" speech that really means: "we don't want to file for bankruptcy and are looking for a way out, but are at the point where we have to plan for it in case the banks don't give us another lifeline (loan covenant revisions). All bankruptcy firms such as Kirkland & Ellis look for alternatives to Bankruptcy, but you don't hire them unless you're on the brink. Blockbuster has become mostly irrelevant in the movie rental market with steep competition from Netflix, Redbox and other movie vending services, and even online streaming. In the current market environment, I'm betting that Blockbuster has very little time left before bankruptcy. Time will tell. Vidabox announced the launch of the new RoomClient: SE system, an entry-level, Windows Vista-based media server. 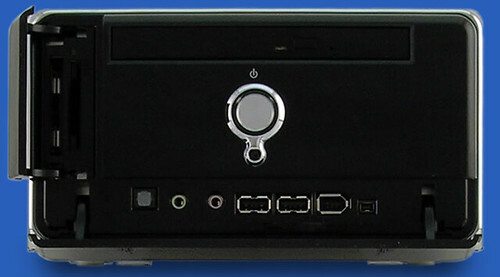 The new media server is targeted at the entry-level customer with a starting price of $2,248. Since I just reviewed the VidaBox Media Center keyboard, this one caught my eye. VidaBox focuses on the high-end customer and installer market, but have added this server/extender device as a less expensive option (for that market). Starting at $2248, the RoomClient:SE stores movies, pictures, music, and more for on-demand access via an on-screen, remote controlled interface. Cover art from movies and music titles are automatically downloaded along with every archival. Complete with 1080p upscaling and full Dolby Digital and DTS support, it's designed to deliver a stunning entertainment experience without compromising quality. The RoomClient: SE system is targeted at the integrator and tech-savvy customer as an entry-level HTPC in a compact, but powerful package. For the person who wants to buy the pre-configured all-in-one Media Center package this device is certainly worth a look. The box is small (smaller than a shoebox) but looks great. I sent a note to the VidaBox rep to see if there is an upgrade path for Windows 7.